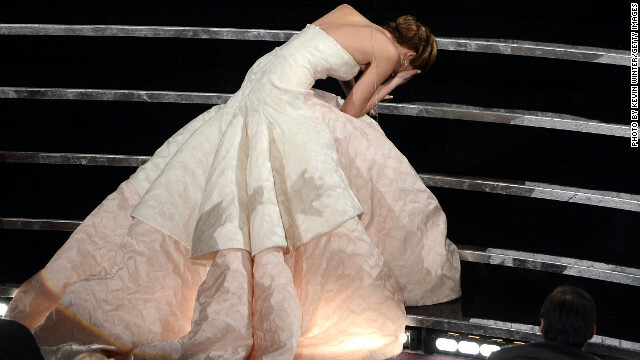 Jennifer Lawrence's infamous fall during the 2013 Oscars could've gone badly. But with this being Hollywood's favorite It girl, even her tumble on the stairs leading to the Oscar stage ended up working in her favor. The "Hunger Games" star easily and endearingly worked the trip into her acceptance speech for best actress, and kept the ball rolling with jokes backstage. But what caused the 23-year-old actress to fall, anyway? That dress had something to do with it, but as Lawrence tells W magazine, there's more to the story. And it involves cake, of all things. Thankfully Lawrence is capable of finding a "Silver Lining." So far, she seems like a real down-to-Earth kind of girl that everyone wants as a friend. Thumbs up! Glad she's ok, but the dress probably had a lot to do with it. I've seen people jump out of planes and their parachute had less material then that dress. I keep hoping that one day Jennifer Lawrence will fall OUT of her dress. I want to take a gander at those lovely, bouncy bazooms of hers. BAZ( o )( o )MS!!! Yeah, its was cake....You tripped. Its ok to just say it. But no, you have to go method acting thru your clumsiness with that dress. It simply was a dumb dress and it made her fall. Poor girl. I felt terrible for her.